Yet, it is also possible to experience the wonderful nature and wildlife without blowing your budget. While the Galapagos Islands will never be the cheapest destination in the world, I have travelled here for less than 60$ a day. This included a double room with a private bathroom, two excursions and lots of awesome wildlife encounters that I wouldn’t want to miss. You can do the same. There are just a few things you need to keep in mind. 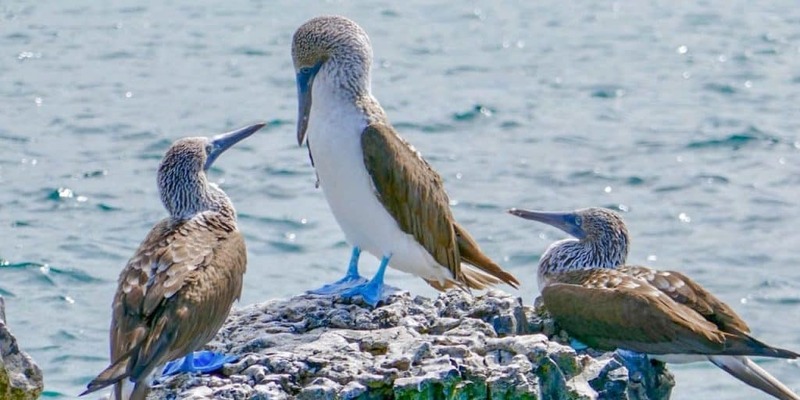 The first thing you will need to choose when planning a trip to the Galapagos Islands is whether to go on a cruise or to base yourself on the islands. Both ways of travelling have their advantages and disadvantages. Cruises take you to places that you often won’t see if you only visit the inhabited islands. On the other hand, you can see most, if not all of the wildlife, while island hopping. And there is no denying that you will save a lot of money by skipping the cruise. As I said, I spent less than 60$ a day during my ten days in the Galapagos Islands. I have not seen a single ten-day cruise for less than 600$. If you book a cruise, your best bet is to base yourself on Santa Cruz and shop around for last-minute offers. But even doing that, you can expect to spend more than 100$ a day, so almost twice as much as what I had to pay for my trip. That said, if you have the money and want to live on a ship, go for it (and then tell me in the comments how you liked it). I have spoken to travellers who have had wonderful experiences on their cruises. But if you are concerned about your budget, go island hopping like my friend and I did. 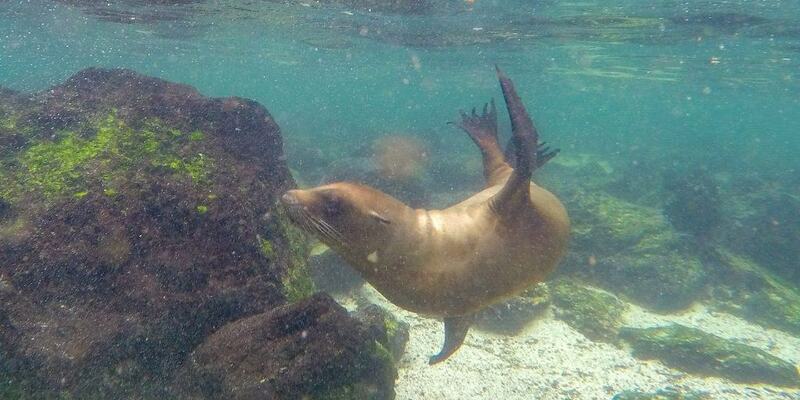 If you decide to travel to Galapagos independently, you will need to plan your itinerary. Most of the archipelago is part of a national park and can only be visited with a guide. That means that, as an independent traveller, you are limited to four islands that you can visit. 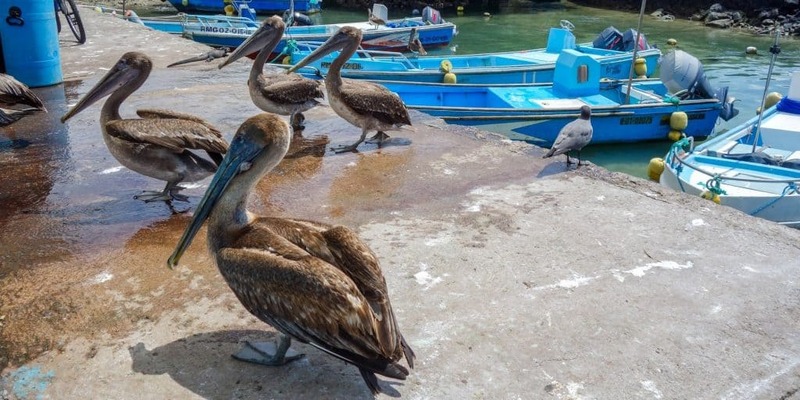 You have Santa Cruz, San Cristobal, Isabela and Floreana, although most people skip the latter because ferry connections are irregular and planning a trip here can be a pain. My friend and I arrived on San Cristobal. Besides Santa Cruz, this is the only option with regular flight connections from mainland Ecuador. San Cristobal is the easternmost island in the archipelago and it is inhabited by more sea lions than I had ever hoped to see on this trip. 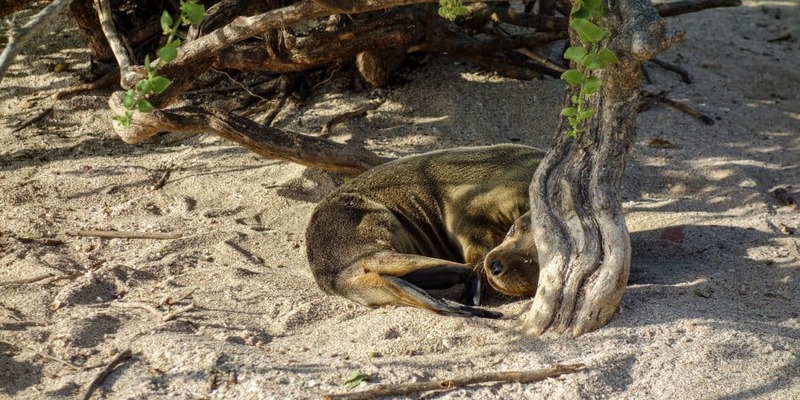 If you travel here, you will base yourself in Puerto Baquerizo, the island’s largest settlement that has been chosen by the sea lions as their favourite breeding grounds. It was only a five-minute walk down to the harbour for us where we kept running into those animals. Besides many sea lions, San Cristobal is home to marine iguanas, lots of birds and also giant tortoises that you can visit at La Galapaguera. Oh, and then there’s this beach with powdery white sand that you can hang out at. There’s lots of stuff to do on this island and if you want to know more details, check out my guide to San Cristobal. The second island I visited on Galapagos was Isabela. To get here from San Cristobal, you have to know that all ferries go via Santa Cruz. You can buy tickets from San Cristobal to Isabela, but the trip consists of two legs and includes a stopover on Santa Cruz. There is no other way. Don’t let that stop you though. Isabela is a beautiful island that you should totally visit! 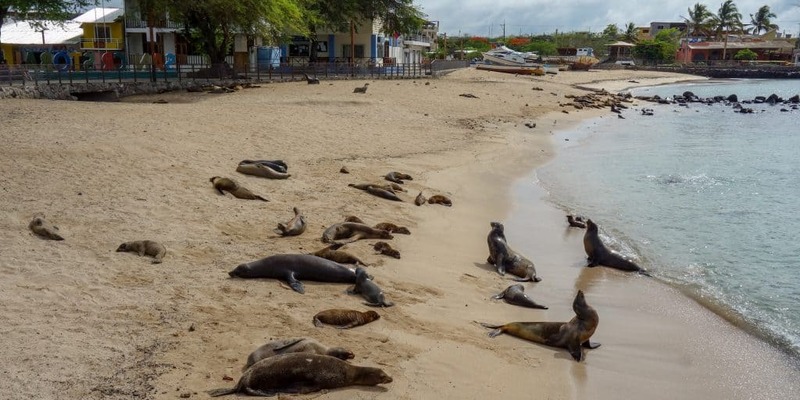 The town here, Puerto Villamil, is the most laid-back you can find in Galapagos. You have easy access to a beautiful beach from here. 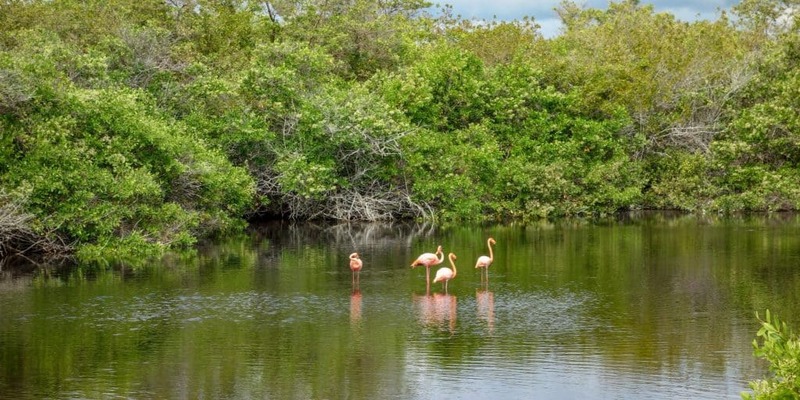 You can see flamingos, hundreds of marine iguanas, blue-footed boobies and so many more animals! Plus, with Isabela being the largest of all islands, there is the option of going on excursions. While those trips are usually very expensive, we decided to splurge here and climb up an active volcano as well as go snorkelling with sea lions and sharks. If you need more inspiration for your trip to Isabela, I have written a complete break-down of all worthwhile activities. Santa Cruz was the last island I visited on Galapagos. We flew back from here to Quito after our trip was finished, but not before having an amazing time. On Santa Cruz, you can find the islands’ largest settlement. Puerto Ayora has around 15,000 inhabitants, which means a better infrastructure (and more fresh produce in the shops). But you haven’t come here for the town, have you? 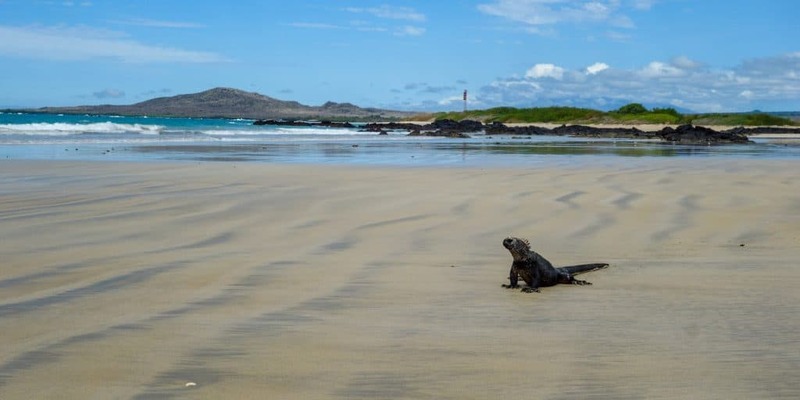 Santa Cruz is home to lots of marine iguanas, sea lions, giant tortoises and the Charles Darwin Research Centre which coordinates all research conducted in the Galapagos Islands. On Santa Cruz, you can also go snorkelling or try the only street food that we had on the islands. Find out more about it and all other activities here. I do not have much to say about Floreana, mainly because I didn’t visit this island. While I have seen pictures of white beaches, amazing wildlife and beautiful nature, I have never spoken to anyone who has visited. I am sure it is worth it since it is less touristy than the other islands. Unfortunately, ferry schedules are irregular and make it difficult to come here. If you have been, though, I would love to hear from you. Galapagos is one of the few destinations where it pays off to book in advance. Unless you are planning on doing a last-minute cruise, you will be much better off reserving flights and accommodation as soon as possible. With only a few budget accommodations available, those tend to book out early and if you go last-minute, you might find yourself stuck in a mid-range or even high-end hotel. The only thing you do not need to book ages in advance are the ferry tickets. Get them as soon as you arrive on your island, and keep in mind that you will have to pay a water taxi to get to and from the ferry. This is another 50 cents to 1 dollar one-way. All flights to Galapagos go via Guayaquil. You have the choice between booking a flight from Quito, that then has a stopover in Guayaquil, or going to Guayaquil overland and booking a flight from there. The latter gives you the option of exploring the city for a day. From what I’ve read when I did my research, flights from here are usually cheaper compared to Quito. However, when I booked, I couldn’t see a difference in price and since Quito suited our itinerary far better, we flew from there. One way of saving on ferry costs and travel time is to buy a multi-stop flight. The inhabited islands on Galapagos have two airports that you can fly to from the mainland. The biggest one is on Santa Cruz (or rather on the tiny island Baltra, which is right next to it). The other airport is located on San Cristobal. We flew from Quito to San Cristobal, but our flight back went from Santa Cruz, which saved us one ferry ticket. Before booking flights, make sure to compare all options and play around with various connections. You never know if it helps you find a better deal. As I already mentioned before, while there are a lot of midrange hotels, it is hard to find budget options on the Galapagos Islands. It gets especially bad if you’re a single traveller and are looking for dorms. Therefore, try to book as far in advance as possible. The best places to search for accommodation are, as everywhere in the world, various hotel booking websites (I have made most of my bookings through booking.com), hostelworld and AirBNB. Especially AirBNB worked well for us and we booked two of our three lodgings through that website. Almost all accommodation offered on AirBNB are guesthouses. We stayed in two of them and they were great. Then we booked a room in a hostel in Santa Cruz and while it wasn’t the best accommodation I’ve ever had, it was at least cheap. My friend and I always had twin rooms with our own private bathroom and paid a total of 286,80$ for nine nights. That might seem a lot but keep in mind that we split the price between the two of us. In the end, we only paid 15,93$ per person per night. It’s more than what we ever paid on mainland Ecuador, but for a place as remote and touristy, it is still a fair price (and it’s downright laughable if I compare it to what my boyfriend and I paid on our last weekend trip to Switzerland). A good way to save money on food is to cook a few meals yourself. I know, it’s nice to go out and eat. But unfortunately, it is also very expensive. Two of our three accommodations had properly equipped kitchens, so we were able to cook most of our meals. Supermarkets are expensive on the islands but still cheaper than going out. Keep in mind that, when going from one island to another, there are restrictions on which fresh produce you can take with you. Some fruit carries disease that you don’t want to spread from one island to another! Processed products, like oil, salt, pasta or even sandwiches, are not a problem. Look up hostel recipes that are simple and don’t use too much fresh produce. 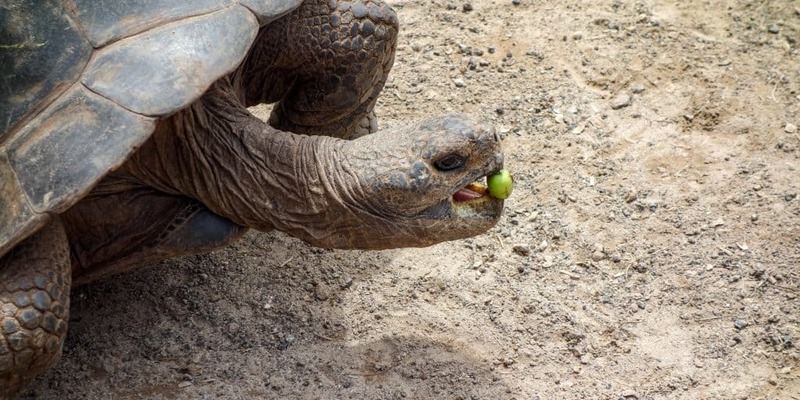 Since everything has to be shipped to Galapagos, vegetables and fruit are especially hard to come by. Pasta and rice dishes are good options, and potatoes were also readily available. The best idea is to look around the supermarkets and local markets and see what they have. And don’t be surprised if it’s hard to get something as simple as fresh tomatoes! While staying on Santa Cruz, you also have the option of trying street food at the local market. Plus, there are stalls of cheap restaurants a bit further away from the waterfront, where you can go and eat various types of seafood. The other islands are less well-equipped when it comes to budget food options. Worst case, even if your guest house does not have a proper kitchen, you can always make sandwiches. We certainly did and it helped us save a lot of money on lunch. In total, I spent 90,08$ on food during the ten days I was there. 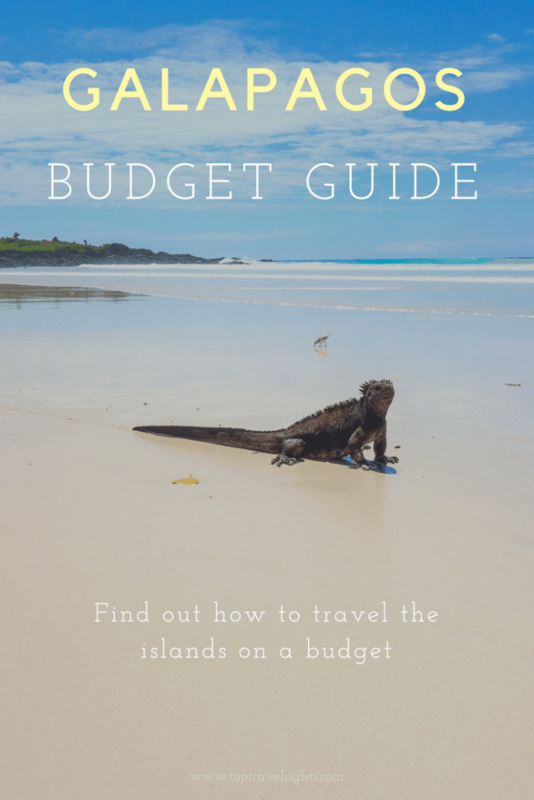 This is probably the most important advice when it comes to travelling around the Galapagos Islands on a budget. While you can go on expensive tours, you can do a lot of activities for free. On San Cristobal, for example, we paid for a taxi to take us to see three places on the island. On Santa Cruz, we did not pay for activities at all. The only island where we decided to splurge on tours was Isabela. But that doesn’t mean that we missed out on anything. Without spending much money, we swam with sea lions, got sneezed at by marine iguanas, saw lots of different species of giant tortoises, took pictures of pink flamingos, went hiking and swimming and relaxed on white-sanded beaches. Seeing animals doesn’t have to be expensive. If you need ideas for what you can do on each of the islands, I have written guides for San Cristobal, Isabela and Santa Cruz. This one ties in with the previous point, but I found it important enough to mention it separately. When you arrive on Galapagos, you will see lots of tour operators with pretty pictures in their windows. It is tempting to go in and book all the tours. They promise to take you to beautiful places and show you amazing wildlife, and surely that can’t be wrong? I am sure that most of those tours are amazing. However, before booking any of them, look into whether you can have the same experience for free. Hiking to the Wall of Tears, for example? You don’t need a guide to go there. Just put on comfortable walking shoes, a lot of sunscreen and take enough water. You also don’t need tours to see sea lions, marine iguanas or giant tortoises. All of those are easy to spot on Galapagos, even without a guide. All nature reserves on the islands, on the other hand, can only be visited with a guide. 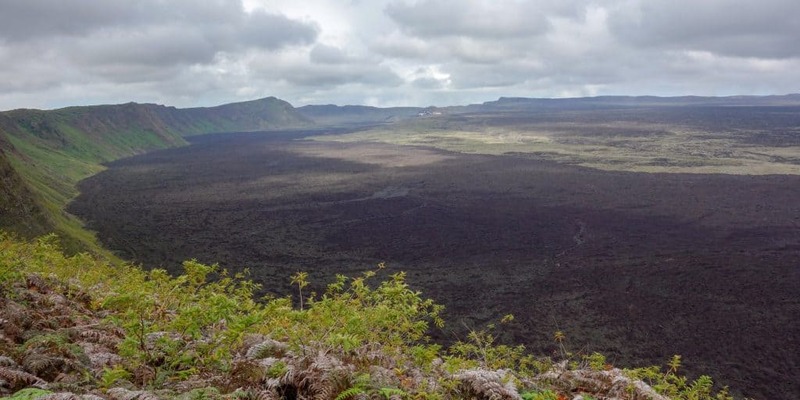 If you want to climb to the top of a volcano on Isabela, for example, you have to go on a guided tour. That’s what we did. We spent the morning hiking to Sierra Negra volcano and then went on another half-day tour in the afternoon. Both tours were worth it, in my opinion, since it was nice to see the volcano and we managed to spot blue-footed boobies in the afternoon. However, we have had so many other amazing experiences that kept us busy that these were the only tours we went on. And we spent a long time planning which tours to take so we could make the best of our money. Also, if you’re interested in snorkelling, you don’t need to book a tour. On Isabela, you can rent snorkelling equipment and go to Concha de Perla. It is a lot cheaper than going with a guide and you don’t have to worry about hitting those other people on your tour with your fins. I’m not saying you shouldn’t book tours at all. Just research first if where you’re going is a place that is only accessible with a guide and if there are any cheaper options available. And then choose wisely what you want to splurge on. So how much does travel to Galapagos cost? Here is a break down of what I paid in total in Galapagos. Some of those, I already mentioned them before. But this is so you can see what I spent my money on. Besides accommodation and transport (and flights, of course), my biggest expense was the entrance ticket to Galapagos. All visitors have to pay for this. In addition, there is a 10$ tax (as of 2018) for all visitors to Isabela Island. Keep those costs in mind when coming here. In total, that makes 595,08$ that I spent on Galapagos, so 59,51$ for each day that I was there. On top of that, I spent another 431,11$ on flights. If you decide not to do any tours, you can cut another 80$ from that budget. And the longer you stay, the less the cost because the cost of transportation and entrance to the islands will be divided by more days. I think my budget is a realistic one that you can achieve when going here, and you might even be able to get it a little bit cheaper. Just remember that most great adventures on Galapagos are free. Have you ever been to Galapagos? How much did you spend? Did you go island-hopping or did you go on a cruise? I would love to hear back from you. Also, for further information, remember to take a look at my guides to San Cristobal, Isabela and Santa Cruz. And if you’re planning on spending more time in the country, there are lots of things on the mainland that you shouldn’t miss.